Funeral service for Harlan Willey, age 90, of Sulphur Springs, will be held at 2 P.M. on Wednesday, January 23, 2019 at Murray-Orwosky Funeral Chapel with Bro. Michael Coker and Bobby Carey officiating. Interment will follow at Gafford Chapel Cemetery with Danny Wilburn, Colton Morrow, Bryan Kellar, Morgan McCoy, Billy Phillips and Bobby Carey serving as pallbearers and Men’s Sunday School Class at Greenpond Baptist Church serving as honorary pallbearers. Visitation will be held one hour prior to the service. 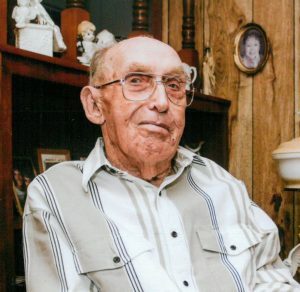 Harlan “Pap” Willey passed away on January 19, 2019 surrounded by his loving family. Harlan was born on January 25, 1928 in Hopkins County, Texas to John and Willy Mae Willey. He married Etta Mae Price. Harlan served in the U.S. Army. He moved to Hurst Euless in 1951 and worked at General Diamanics for 14 years then worked at Menesco for 26 years building airplane landing gears, he than retired back to Hopkins County in 1980 and raised cattle, a vegetable garden and worked as a carpenter. Harlan’s life was filled with love for the Lord, his family, his church and his many friends. He is survived by his wife of 45 years, Etta Mae; brother, Von D Willey and wife, Judy of California; step children, Elizabeth Wilburn and husband, Steve, Tommy Phillips and wife, Rhonda, Brenda Carey and husband, Bobby who live in Missouri; grandchildren, Danny Wilburn (Amanda), Tammy Wilburn, Bryan Kellar, Lisa Phillips Smith (Bobby), Shannon Mitchell (Scott), Billy Phillips; great grandchildren, Colton Morrow, Morgan McCoy, Macie McCoy; great great grandchild, Averi McCoy. Harlan was preceded in death by his parents; sister, Inez Newsome; brothers, Howard and Junior Willey; daughter, Rhonda Kellar; son, Gary Willey; grandson, Andy DeWitt. Memorials can be made to Greenpond Baptist Church.